As the Reigning Queen of Bodyshop Modding, I've discovered a way to quadruple the number of default skins we can have in the game. I've figured out a way of tying the skins to the hair colors. What this means, is that you now can have 16 default skins, and they can include things like body hair, and it will actually be genetically correct. It also means that we can now draw hair on infants and it will be the correct color 100% of the time. The third repercussion this has is that we can actually have ethnic/racial diversity in our towns. You can have S1Black be an Asian skintone, while S1Red is a ginger with freckles all over. This is a seriously awesome thing, no more having to create half decent looking townies with hundreds of custom skins. You can have diversity automatically. Because they are defaults, you don't need to respawn any townies, the second you place my packages into your game, they will pick up the new skins. Each skin/haircolor is in its own package, so its easy to remove only a single skin when you find one you like better. You can have your S1Black from HP, your S1Brown from fansee, your S1Blonde from leesester, your S1Red from daluved, your S2Black from me, your S2Brown from QBuilderz, your S2Blonde from whiterider,.... and they didn't have to make all 16 skins. They may only have made the one skintone in that one hair color. As long as everyone uses my templates to make their correlated skins instead of trying to reverse engineer everything I did and do it all over again the hard way, all the skins that get created will work together. So, save yourself the trouble, and use my template, that's what it's there for! I've broken this download into a multi-post download so I can better explain each aspect of this. For the rest of this main post, I'll be talking about body hair, Ethnic Diversity, and how to get started with this in your own game. For infant hair, go to comment #2, for Supernaturals press #3, and for the templates you'd need to create these yourself press #4, and for all other inquiries or to speak to a representative, please stay on the line and we will be with you shortly. I've taken the TS2 standard of AllenABQ hairs and added them to the Maxis skintones. You can download them here. I have had to remove (ahem, shave) the pubic hair off the guys to be compliant with PayPal Terms and Services (MTS can't host adult stuff here or they won't let us use their service). So, if you want the natural version, head over to SexySims to download them. Seems backwards to me too, but what can you do? Since it seemed a waste to bother with the females when I couldn't add pubic hair, the version here is for Teen, Adults, and Elder Guys only. 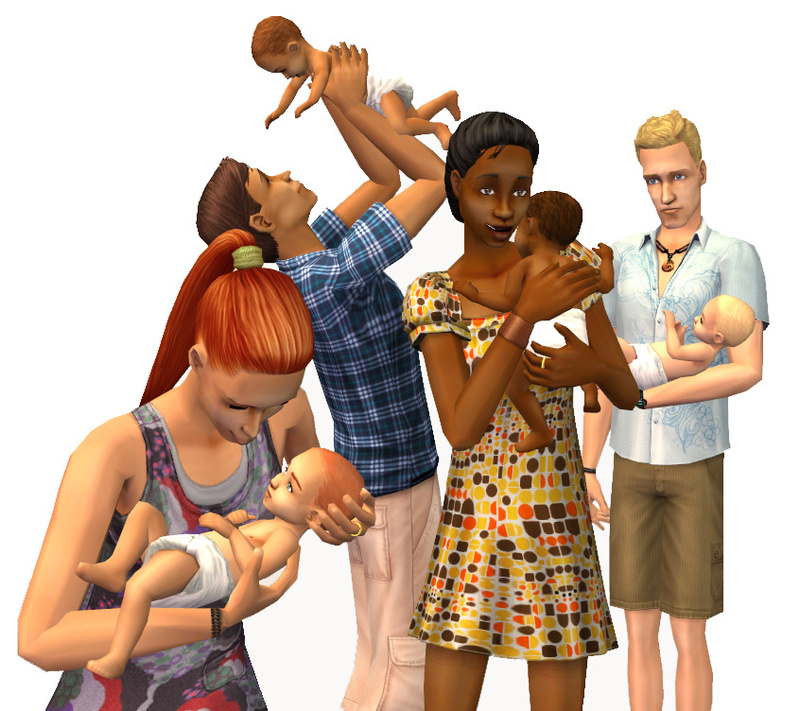 Children, toddlers, and babies do not have hair added in this version. They are meant to blend in with the Maxis defaults. Because body hair isn't everyone's thing, and creating your own is hard for a lot of people (I promise, it's not hard, its just tedious), I've created a 'blank' set that will allow you to start slowly collecting your own set. They are 16 skins that will reference whatever you have as your default skins. If you don't have defaults and still use Maxis skins then it will use those skins. If you have one of HP's pretty skin sets or anyone else's it will pull that. Why is this useful you ask? Well, as soon as someone makes a correlated skin that you like, you can remove the coordinating referencing skin and you can use it, even if the creator has only made one skintone/haircolor you like. You need to keep a full set of 16 correlated skins in your game, but it doesn't matter who's 16 they are. Start with mine, and replace them as you find ones you like better. This way you don't have to give up your pretty default skins all at once, you can do it slowly as prettier correlated skins appear. This is the part that excites me the most. 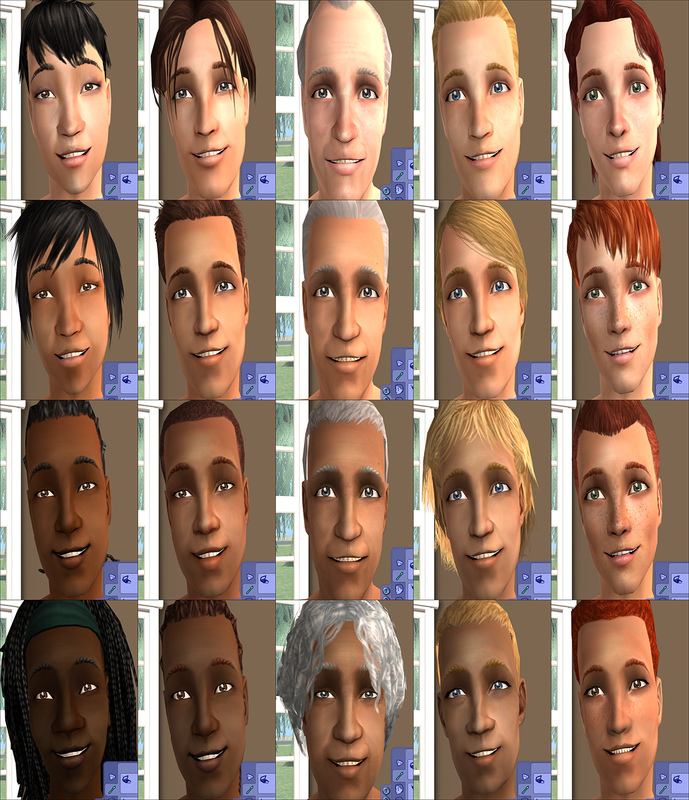 With 16 different skintones based on hair color, I can create ethnic diversity within my game! This is how I see it for my game. Now, this is just what I have in my game, you can create your own matrix. Download the Referencing version to start from and as you get more of them filled in, delete the corresponding Reference one. *YOU NEED TO KEEP A FULL SET* But, it doesn't matter who made each piece of it. Mix and match! I'll also be adding links here of other creators who've gone and created skins for this set so you can really pick out and customize your favorite set. If you make a skintone from my template and upload it, please send me a link so I can add it here! Wait, What do I Download? Do you like what you see and just want it in your game? A: Download the 4 BodyHair skins and the infant skins. Do you like the idea, but hate the maxis skins? A: Look for other creators' Correlated Skins in my link tables, more will be added as creators make them. Do you like the idea and want to turn every skin you own into one of these? A: Download my Templates and go do my tutorial. P.S. I'd appreciate it a lot if you hit the 'Thanks' button, if you feel so inclined! A big thank you to my little sister, GreyMoon, for her continued help me with a lot of the supernaturals busy work as I've been seriously short on time to do everything myself. 866 people have said thanks to Phaenoh for this download.